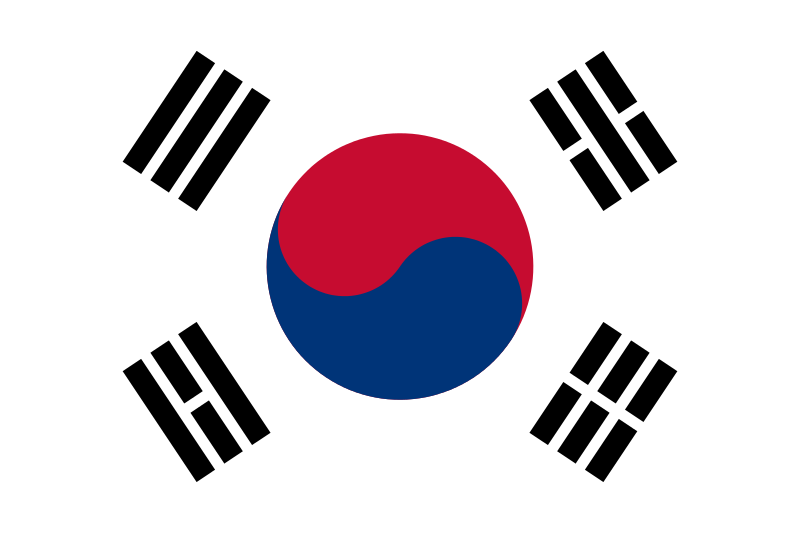 The flag of South Korea, or Taegeukgi (also spelled Taegukgi in convention) has three parts: a white background, a red and blue taegeuk (also known as Taiji and Yinyang) in the center, and four black trigrams, one in each corner of the flag. These trigrams are carried over from the eight trigrams (Ba gua), which are of Daoist origin. Taiji, trigrams, and Taoism, which originated in China, are parts of the Korean Culture. 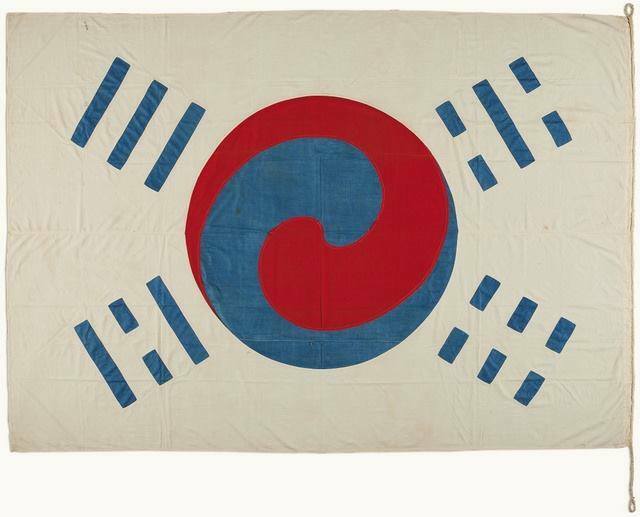 The flag was designed by King Gojong or Pak Yeong-hyo in 1882 by the deletion of four of these trigrams, and Taegeukgi was adopted as the national flag of Joseon Dynasty on March 6, 1883. After independence, both North and South Korea adopted versions of the Taegeukgi, but North Korea changed its national flag to a more Soviet-inspired design after three years. 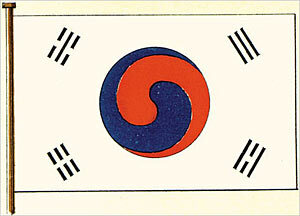 The Constituent Assembly of the Republic of Korea (South Korea) adopted the Taegeukgi as the national flag on July 12, 1948. After the establishment of the government of the Republic of Korea, “The Rules for the Flag of the Republic of Korea” were first enacted. Okay…somebody must of messed up big time here when they revised the flag a long time ago. The four trigram on the Japanese drawn diagram (the black and white, top left, first row of flags) has the correct 4 trigrams if they are wanting to show north, south, east and west compass direction. Wikipedia’s entry is incorrect regarding the compass direction on the current modern South Korean flag. At the moment, it is showing north, south, south west and north west. The compass (literally translated as a “pointing south needle” in Chinese) with south at the top, west on the right, north at the bottom and east on the left. 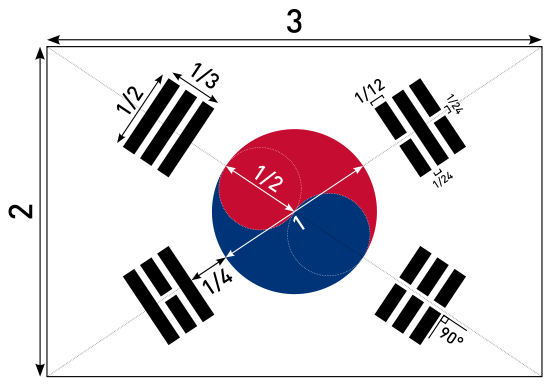 If you look at the modern South Korean flag, the bottom left trigram represent south, the top right trigram represent north, but the top left diagram represents north west and the bottom right trigram represents south west.